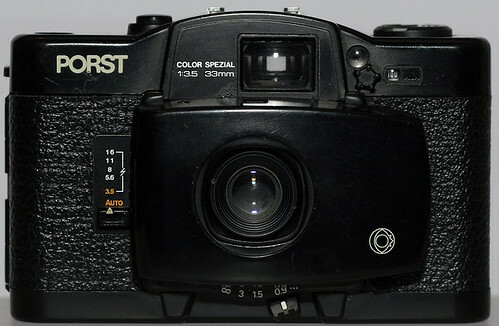 Cosina's CX-1 is a Japanese 35mm viewfinder camera that was the fore-runner of the CX-2, which in turn was copied to make the LOMO LC-A. The finder and lens are protected by a rotating cover, which also locks the shutter release. Scale focusing in four zones (0,9–1,5–3 m–infinity). Shutter: Programmed electronic shutter, 2–1/500 s.
Coupling range: EV2–EV17 (at ISO 100). Flash: Hot shoe, dedicated flash CX-11 (GN 11) available. Finder: Bright frame viewfinder, LED indicators for slow shutter speeds and battery check. Power: 2 x SR44/LR44 1,5 V button cells. Dimensions: 103 x 66 x 42,5 mm. Weight: 225 g without batteries. This page was last edited on 24 September 2018, at 05:13.